spirited designs // visual distractions: Photo Friday: This photo won my first travel photo competition prize! Photo Friday: This photo won my first travel photo competition prize! ‘Brave Man and Smoking Volcano’ is one of the 10 winning photographs in the photo competition ‘Let’s Take Flight 2013’, organized by Insight guides together with APA Publications, Fujifilm and National Library Board Singapore. In April it was one of the happiest moments in my life (really!) 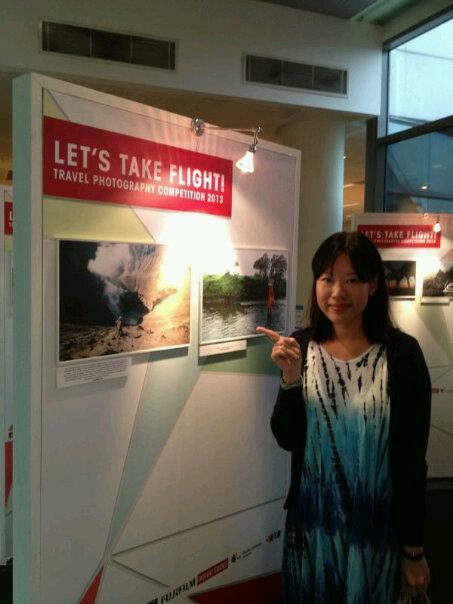 when one of my photos won a travel photo competition. I had just taken this photo in February, 2 months before and only having a year or so into analogue photography, I was taken by surprise when it was selected, one of the 10 out of 300 over entries. To me this is an interesting journey about learning about photography. I asked many people about the photos they liked and many chose those that I would not have selected myself - photos they said had an atmosphere, a feeling of something magical, a sense of mystery. Personally I like them, I like the gradient of colors captured and I try to take 'clean' photos, making almost the whole area just in one or two colors, not too busy photos. But I also like to take postcard pretty photos that look like it could be an advertisement for a place, and also the quite kitsch photos that make people go 'awww'. In this selection, a friend who is also an avid traveller and photographer, and another who has a facebook page of travel photographers' selections (nomadasia) helped me to make the choice. I wouldn't otherwise have submitted this photo, in fact. Also, on some journeys I had never thought to go - I have never heard of the place, Mount Bromo, until the month before the trip where my well-read friends told me about it, and were so big-hearted that they didn't mind me tagging along. Liking to explore slowly as well, they left me with enough time in one place to be able to take my time to capture interesting shots. One of my facebook friends recently went to Mount Bromo and he said he went there based on the photos I took of the place, he had never heard of the place prior to seeing them on facebook! To me, that is really an accomplishment in my travel journey, to inspire others to make their own travel adventures!